We understand you have a busy lifestyle! For your convenience in addition to our weekday appointments, we also offer evening, Saturday and virtual appointments. We are geared to a relaxed and hassle-free appointment so that you can focus on the work of improving your nutrition and health. Through our quick and easy online appointment form and pre-registration form downloads, you’ll be successfully registered in our system – and then we can spend MORE time on your visit and our conversations. Download, Fill In And Bring With You At Your Scheduled Visiting Time. Let us know your scheduling preferences. Simply fill in the pre-registration form below and check off your availability, and we’ll forward appointment options. 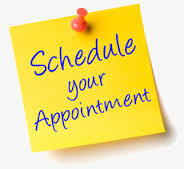 Sometimes we even have same day appointments - but please call us at 703-201-1184 to inquire about same day options. Connect with us and let us know your scheduling preferences. For your convenience, we have evening and Saturday appointments. Simply fill in the pre-registration form and check off your availability. We’ll do our best to accommodate your request. Sometimes we even have same day scheduling – but please call us at 703-201-1184 to ask about same day options. Who Knew? This is a good option to consider if you’ve had your fill of traffic or if there are no local experts to help you with your nutrition challenges. We’ve found that many of our clients like this option for the convenience. You just need a device with a web cam and internet connection. All you have to do is fill in the pre-register form and check off that you’d prefer a Virtual Appointment. Scheduling Policy: In the event you are unable to meet your scheduled appointment in-office or virtually, we require a 24 HOUR NOTICE. If you do not meet this requirement we will invoice for the time to the registrant’s billing address on the form. Payments: Fairfax Nutrition accepts most major credit and health saving account cards as well as PayPal® instant payments for our Virtual Nutritional Counseling. We also accept personal checks and cash. Payment is due at time of service. Insurance: We do not process insurance claims but we can provide you with a medically coded receipt for you to submit to your insurance company for reimbursement. Eat Right - Move More - Breath Easy & BELIEVE IN YOURSELF!